This private, remodeled, riverfront cabin on Donner Summit is available as a vacation, seasonal or sometimes as a long term rental. The cabin sits in a beautifully forested setting right on the Yuba River. Private and isolated, this cabin has only one neighboring cabin (which is usually vacant) that can be seen from the property. Access is 1/3 mile off Donner Pass Road on a maintained dirt/gravel road. Hiking, fishing and mountain bike riding start right at the property. The cabin has everything you need for vacation or full time living. The main cabin has a double bed alcove off the living area (best suited to shorter people), a galley kitchen, television with VCR (no cable here), wood stove and separate toilet and shower facilities. The deck features table, chairs and a gas BBQ grill. The detached bunk house offers most of the sleeping accommodations with one double bed and two twins plus a climb-in loft with a double futon (very fun for the kids). Total sleeping can be for eight but this is very cozy. Better suited to 2 to 4 people or a family. An outdoor granite fire pit is a great amenity; however, its use can be seasonally limited related to fire danger restrictions (the gas and charcoal barbeques provided are good alternatives). This setting is a wonderful opportunity for the adventuresome. Biking or walking on the endless Sierra trails in this remote setting is calming to the soul. Kids and dogs can run and play in the woods and river (check for how fast the river is running first). Not suited to those looking for lavish or expansive accommodations. Perfect if you like to camp but would rather skip all the set-up and you enjoy having the basic comforts of home. Enjoy an "Old Tahoe" style vacation at the cabin or hop in the car to hit the many attractions of Donner Summit, Truckee, Donner Lake, Squaw Valley and Lake Tahoe just 10 to 40 minutes away. This cabin offers the best of both worlds. We have lived in the Tahoe area for decades and now just come and go part time. We love the outdoors and have never found a better place to live or visit than right here. Recreation opportunities and the unparalleled beauty of nature abound in this corner of the High Sierras. We are most at home here. We are glad to share our little piece of heaven with others when we are not using it. We love the tall pines, the beauty of nature surrounding this precious cabin and the raging waters or peaceful serenity of the Yuba River right at our door step (depending on the time of year). This property offers the outdoor opportunities and feel of camping without all the fuss. Sleep in a comfortable bed, enjoy a real shower, cook in a fully appointed kitchen or BBQ outside. All ready to go with no set-up. We hike, mountain bike, kayak, fish or tube right from the property. The sound of the rushing Yuba River as it rolls over granite boulders in the spring is one of the highlights as you hike from this cabin. In the winter we love to cross country ski up the river and see the ice formations dance in the water. This is a peaceful place to just relax. We have had wonderful times with family and friends isolated away from the hustle and bustle of everyday living. It feels like you are far away from everything in this "Old Tahoe" vacation retreat. In reality you are just a few miles to four ski resorts and Woodward Tahoe, a 15 minute drive to Truckee and Donner Lake, and 30 minutes or so to Squaw Valley, Northstar and Lake Tahoe. Choose the best of all Tahoe has to offer or just sit on the deck and watch the trees grow and the river roll by. Bathroom is separated into a sink and toilet in one room and a shower in another room. Functions well in group settings. Once it starts snowing then the cabin is a hike in cabin, you may either bring your snow mobile or cross country skis to get back to the cabin. A table with folding leaves offers flexible seating options for dining in the mail cabin. Outdoor dining on the deck is a very enjoyable option in the summer. 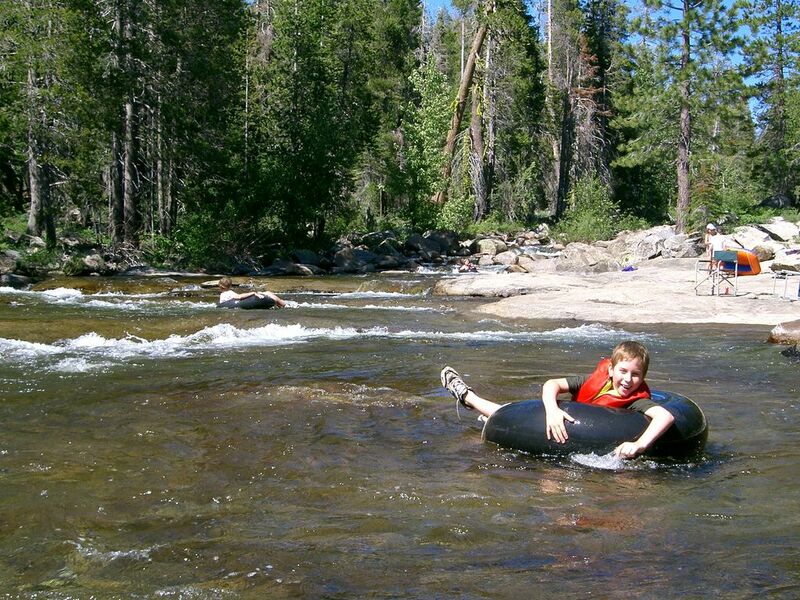 The Yuba River, the giant granite boulders, the tall pine trees, extensive forest trails are like a great natural playground offering recreation for the whole family to enjoy together. We had such a good time in the little cabin and bunkhouse. We swam all day and went into Truckee at night for dinner and fun. We only saw people once in the little cabin cluster. Everything you need is there including bug spray for those who forgot their's. Bring some inner tubes for floating. You can't go wrong. This is our second trip to the a frame. We came in the summer and loved it so much we tried it out in the winter and we're not disappointed. The cabin has everything you need and is surrounded by beauty. This is on our favorites and we will be back again and again. Cute cabin. Rented it for most of the month of December until we found out that there is no valid parking for this cabin in the community lot. Despite owner's claims to the contrary, you can't park here in the winter! The HOA people will make you remove your vehicle, thus making this property virtually inaccessible during snow months. Otherwise, lovely little place. Love this cabin and location!!! This cabin is a good spot for a private weekend in the woods, or for families with the bunkhouse being a great place for the kids. If you're looking for maid service and plush surroundings this is not the place for you...but if you're looking to spend some time with nature without sacrificing all the comforts of home then this is a great alternative to tent camping. The river was low during our visit but we found great swimming holes just a few exits down, and there are plenty of trails to hike. Although you can still hear the freeway a bit, the cabin is set well back in the woods and is fairly private. The large fire pit was great for relaxing even as the night cooled off. The only suggestion I would have is for screens on more of the windows; the home retained a lot of the daytime heat and it was slow to cool down with the small screened windows. But who knows; maybe the squirrels just steal them anyway! I think that if you're expectations are realistic and you want a comfortable place to escape modern life while still being able to take a shower, this cozy little cabin may be just what you need. It was for us! Thank you for your response and glad that you had a nice time. I will suggest screens to the owners and see if we can get some screens up to be able to open up the windows. Take care and do remember us for next get away. We had a wonderful stay at your cabin with our 2 year old son, and our dog absolutely loved the river. We had everything we needed and the cabin was the perfect setting for a relaxing vacation. Look forward to coming back soon!